Pioneer Tower is about to get a makeover that will take it and visitors back in time. 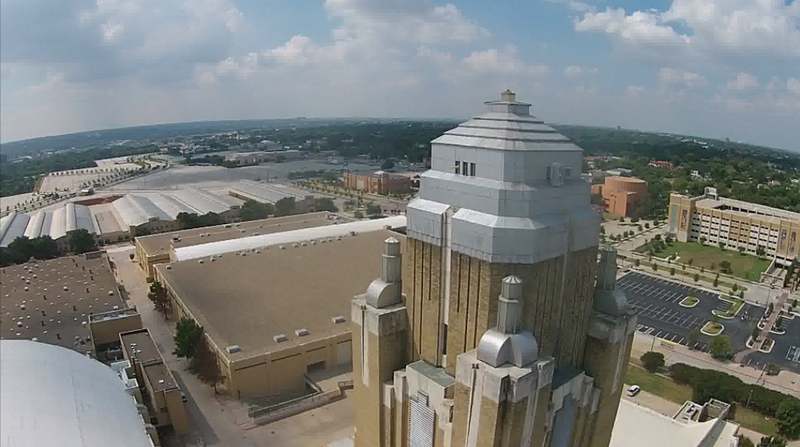 At its Tuesday June 12 meeting, the Fort Worth City Council authorized an agreement with Elements of Architecture Inc. for the rehabilitation of Pioneer Tower at the Will Rogers Memorial Center. Noted Fort Worth architect Wyatt C. Hedrick designed the 208-foot tall Pioneer Tower and adjacent buildings of the Will Rogers Memorial Center for the Texas Centennial celebration in 1936. The tower, then built in 1938, is on the National Register of Historic Places. It stands as the centerpiece of the Will Rogers Memorial Center and of the Fort Worth cultural center. When first completed, Pioneer Tower was designed with columns of glass-blocks on each side that were illuminated at night. However, the glass block features were covered with metal plates in the late 1970’s, and the tower has been dark for almost 40 years. Elements and their team will perform exterior and interior rehabilitation work to the tower that will once again allow the tower to shine on Fort Worth. The completion of the rehabilitation and re-lighting of the tower is scheduled to correspond with the opening of the new 14,000 seat Dickies Arena (www.Dickiesarena.com) in late 2019. The tower is built of concrete framing, clad with limestone and brick. The corners are accentuated with stepped pilasters, lighted lanterns and crowned with an aluminum cap. At the base of the tower there is a large room with a high domed ceiling and a bronze bust of Will Rogers. Originally the tower had a vertical strip of glass block, which was backlit at night on all four sides. Over the years occasional movement and other forces placed stress on the block and many of them have broken. At some point in the past, rather than repair the block, the glass block was covered with aluminum louvers (grates). • Historic fabric condition assessment. • Cleaning the exterior of the tower. • Structural analysis to limit movement and isolate the glass block. • Electrical design for a new internal lighting system to backlight the glass blocks. • Removal of existing aluminum louvers. • Any associated architectural design. This approval follows a presentation by Kirk Slaughter, director of the city’s public events department, a couple months ago. He said the plan for the tower is to take it back to its original form, including putting lights where grates are currently. He suggested LED lights so they can change color. Funding for the project, approximately $1.5 million, will come out of the culture and tourism fund. The goal is to complete the project by the time the new Dickies Arena opens in November of 2019. In order to meet this aggressive schedule, the city plans to hire a construction manager at risk (CMAR) contractor to assist in the design phase and carry through to the construction phase and work with Elements of Architecture. A recommendation to award construction services will be brought to City Council in or around August. A new logo has also been proposed for the tower in a bronze design. Also expected in August, Martha Peters and Fort Worth Public Art are expected to present a proposal to the Council on making the tower an iconic public art project. She suggested using the tower for projection mapping, such as was displayed during the recent Winter Olympics Opening Ceremonies. Other cities with projection mapping projects include Sydney, Montreal and Santa Monica. Peters said her organization has asked artists Joshua King and Shane Pennington to be consultants on the project. Should the Council decide to add this to the project, the unveiling would be at the opening of the Dickies Arena.